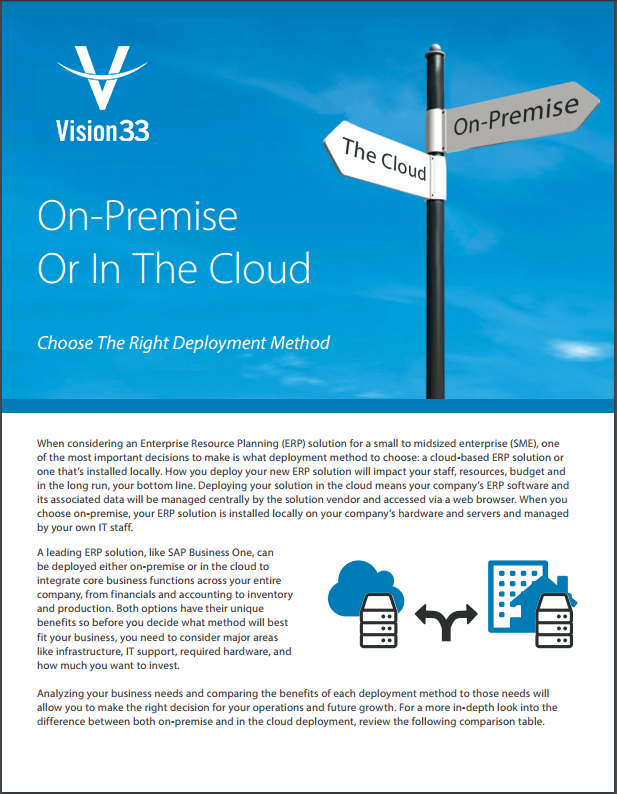 What's the Difference Between ERP On-Premise vs. The Cloud? Depending on your business needs, resources and budget, choosing to deploy your Enterprise Resource Planning (ERP) solution on-premise or in the cloud can make the difference in maximizing your return-on-investment. Designed and priced for growing small and midzised companies, SAP Business One is available on-premise and certified in the cloud with Amazon Web Services (AWS). SAP Business One is an affordable, powerful solution that integrates and streamlines all your key business areas. By deploying this program in the cloud, all your valuable information is protected in a secure, world-class cloud environment - giving you access anytime, anywhere so you have more time to spend on running your business and less on IT. To help you choose the right deployment method, access our ERP Deployment Guide by completing the form.